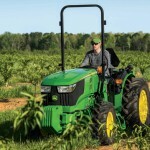 John Deere has added a pair of new tractors to its 5 Series – the 5E and 5ML. 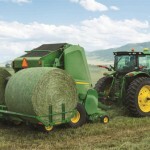 John Deere says its new four-cylinder 5E Series Tractors are built for a variety of applications such as livestock feeding, haying operations, roadside mowing and property maintenance. The two new 5ML models are low-profile machines, ideal for environments with restricted heights. The new four-cylinder 5Es feature heavy-duty frames, axles, engines and transmission. 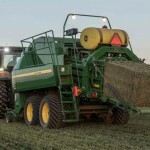 Available in 85 and 100 engine horsepower, the 5085E and 5100E are powered by John Deere PowerTech 4045 diesel engines that meet Final Tier Four emission standards. 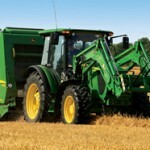 The tractors have more than 3,200 pounds rear-lift capacity and more than 3,500 pounds at full front loader height. The 24/12 PowrReverser transmission in these machines increases top transport speed by one-third. Operators can shift from low to high at the touch of a button, without even needing to clutch. 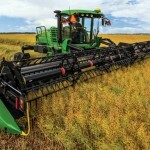 The economy PTO, standard on all 5E four-cylinder transmissions, lets operators reduce engine rpm to 1,700, which John Deere says can lower fuel consumption by as much as 20 percent. The new sloping hood and raised operator platform on cab models offer 3.6 feet of extra visibility in front of the tractor. Design changes to the control pod and instrument panel promise easier monitoring and operating control. The operator has warning lights, ground speed, PTO speed, PTO target bar, PowrReverser position, hour meter, hi/lo indicator, and diagnostic codes visible on a single screen. Other features include a new slide-out condenser, radiator screen, tilting charge air cooler, and slide-out oil cooler. 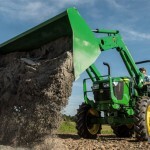 Along with the new 5Es, John Deere is bringing out the new 5ML Tractors designed for working in low clearance and tight spaces such as poultry barns and orchards. The 5ML models come standard with Final Tier 4 compliant John Deere PowerTech engines that automatically perform regeneration. The 5ML comes with a mechanical hitch and two transmission options: the 16F/16R or 32F/16R PowrReverser for clutch-free forward and reverse operations. Other features include a new backlit LCD instrument panel , two rear work lights, and new easier-to-access charge air engine cooler and hydraulic oil cooler packages. Factory-installed options include fuel tank guards and an SCV oil spillage collection system.